If you have consumer returns or excess inventory which is unsold or unwanted, you have a chance to turn those athletic shoes into money and profit for your running store! Sneakers4Funds will issue you a check for all of that merchandise. What do you get with no out-of-pocket costs for the Running Retailer shoe drive fundraising program? Every year, millions of athletic shoes are placed in "off-price" channels in an attempt by companies to recover money for returns, unsold or unwanted footwear. But, when these items end up in discount shops or outlets, the brand image can be hurt. In many cases, brands prefer to destroy or throw away the athletic shoes rather than jeopardize their brand. However, as corporations, businesses, government, and society try to deal with global climate change, adding to the world's carbon footprint is not socially responsible. What happens with the athletic shoes? When Sneakers4Funds issues you a check for the athletic shoes, we consolidate the footwear with others and ship the merchandise to micro-entrepreneurs in developing nations around the planet. Because of systemic poverty and lack of job opportunities, millions around the world have to create their own work prospects, and many turn to selling athletic shoes in their local communities for commerce and profit. Sneakers4Funds is the preeminent social enterprise for athletic shoe drive fundraising in North America. It is a for-profit company that was under the leading shoe drive fundraising brand, Funds2Orgs, before it became its own independent brand due to the immense demand from sports clubs, teams, clubs, corporations, businesses and schools for athletic shoe drive fundraisers. What is an athletic shoe drive fundraiser? With an athletic shoe drive fundraiser, your champions never have to write a check or give you money. Instead, athletic shoes become the currency and Sneakers4Funds issues you a check for the athletic shoes you collect during your fundraiser. During an athletic shoe drive fundraiser, you ask supporters and community to give you their gently worn, used and new athletic shoes. When Sneakers4Funds receives the athletic shoes, you will be issued a check! It's that easy! Are there any out-of-pocket costs to me? There are never any out-of-pocket costs with any other program with Sneakers4Funds. Depending on your fundraising agreement, freight costs may be deducted from the amount of the check issued to your designated organization. For more information, please see your Sneakers4Funds fundraising agreement or call the fundraising coaching team at 407-930-2979. What are the 3 key benefits of doing an athletic shoe drive fundraiser? 1. You get to raise money for your sports group, club, team or a favorite charity. 2. Sneakers4Funds is a social enterprise, and we partner with small business owners in developing nations with a hand-up, rather than a hand-out. 3. You provide your community with a socially responsible fundraiser where athletic shoes are re-purposed and don’t end up in the trash where they harm the environment. What does it mean to repurpose? It means to give something a new life or purpose. Sneakers4Funds ships athletic shoes collected in athletic shoe drive fundraisers throughout North America to micro-entrepreneurs in developing nations where they are "re-purposed." What happens to the athletic shoes collected in a Sneakers4Funds athletic shoe drive fundraiser? They are shipped to micro-entrepreneurs in developing nations. Due to systemic poverty, many families around the world do not have sufficient and sustaining work opportunities. Sneakers4Funds sells the athletic shoes collected for a small fraction of their original price, often on credit. 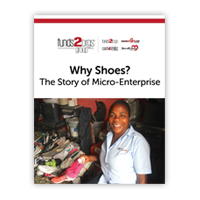 These micro-entrepreneurs, or small business owners, then prepare the athletic shoes for sale, commerce, and profit. By the way, most people wear athletic shoes in developing countries because they use their feet to get from one place to another. Why do the sneakers have to be rubber banded or have the laces tied together before they are placed into the shipping bags? We want to process your athletic shoes quickly so we can issue you a check. By making sure that pairs remain together, it helps to ensure speedy processing. If I need more bags, what do I do? Simply contact your Sneakers4Funds coach. Your coach will make sure you receive additional supplies. What types of athletic shoes can someone give to a Sneakers4Funds athletic shoe drive fundraiser? Sneakers4Funds only accepts gently worn, used and new athletic shoes. Athletic shoes include sneakers, trainers, cross-trainers, walking shoes, and racing shoes. Does Sneakers4Funds accept athletic sports shoes with cleats? Yes, we even accept cleats. They just have to be gently worn, used or new. Does Sneakers4Funds accept single athletic shoes? Unfortunately, the answer is no. All of the athletic shoes you collect are shipped to micro-entrepreneurs (small business owners) in developing nations, and they sell the footwear in their communities. People need to buy pairs of athletic shoes and not singles. What condition is acceptable for the shoes? The athletic shoes have to be gently worn, used or new. Remember, these athletic shoes are going to be repurposed and worn again, so they have to be in the best condition possible. What happens if we collect more athletic shoes than was our goal? Congratulations! More athletic shoes = more money. Am I able to designate a specific country or region where my athletic shoes will be shipped? We’re sorry, but it’s not possible for Sneakers4Funds to have this happen. Due to logistics and costs, it is essential to combine the footwear you collect with those from other athletic shoe drive fundraisers. They are then shipped in lots overseas. Does Sneakers4Funds accept store returns or hash lots for sale from a manufacturer or wholesaler? The short answer is, yes. Please contact Tom Henderson, Chief Fundraising Strategist at 407-930-2979 for more information. It’s easy to get started. Just click here to fill out our form so a Sneakers4Funds fundraising coach can call you. Or, call us at 407-930-2979. What is the Sneakers4Funds Running Retailer Program? How does the Running Retailer Program work? To learn more about the Running Retailer Program, call us at 407-930-2979 and speak to one of our fundraising coaches. How much does my favorite charity earn by my participation in the Running Retailer Program with Sneakers4Funds? Find out more about how much money your preferred cause can earn by calling us at 407-930-2979.
Who can participate in the Running Retailer Program? Any business that has inventory of athletic shoes can participate in the Running Retailer Program. What if I don't know what charity should receive a check for the unwanted athletic shoes we give to Sneakers4Funds for a social cause? That's not a problem. Sneakers4Funds has relationships with thousands of nonprofits, schools, civic groups and others that would be happy to receive a check issued by us on your behalf. Just speak to us at 407-930-2979. When will the designated charity we choose receive our check from Sneakers4Funds? Your athletic shoes will be weighed and processed within 2 business days of receipt of the shoes at our warehouse. At that point, a check will be issued along with a reconciliation statement. If we happen to be in your neighborhood, we'll collect your athletic shoes sooner than expected. How often should I expect to have my athletic shoes collected by Sneakers4Funds? The logistics team of Sneakers4Funds will be in touch with you during your athletic shoe drive. We can’t guarantee a shoe pickup during your shoe drive other than the pickup at the conclusion of your drive. Therefore, it’s important to have adequate storage space to hold the bags during the entirety of your campaign. If a Sneakers4Funds driver happens to be in your area during your shoe drive, we may arrange for a pickup.